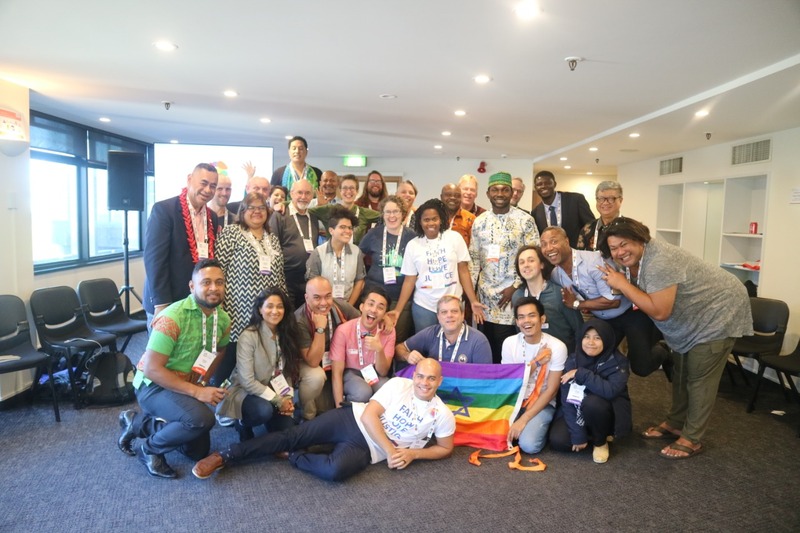 Every two to three years one of the largest gatherings of sexual and gender minority activists takes place, uniting members from across the globe in order to keep up with the progress and stumbling blocks that we as LGBTIQ+ organisations, allies and partners have been making. 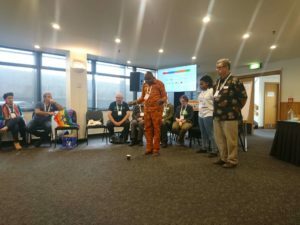 This year the ILGA (International Lesbian, Gay, Bisexual and Intersex Association) World Conference took place in the picturesque harbor capital city of New Zealand, Wellington. 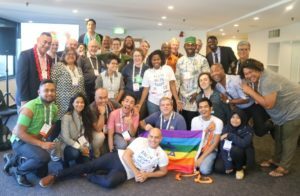 The ILGA World Conference ran from 18 – 22 March, parallel with the Wellington International Pride Festival, which added to the celebrations amongst delegates. An African traditional ceremony is done by Davis Mac-Iyalla as part of the interfaith opening devotion on Day 2 of the Interfaith Pre-conference at the Michael Fowler Centre. As GIN we worked closely with a number of partners and allies both locally in Wellington and those who travelled in for the conference in order to co-host an Interfaith Pre-conference. Our pre-conference was proudly hosted by St Andrew’s on The Terrace and the Michael Fowler Centre on the 17th and 18th of March respectively. A total of 59 delegates from 25 countries and multiple faith traditions attended during the two days despite there being a number of other pre-conferences taking place concurrently. We spent time reflecting on the achievements thus far with regards to the LGBTIQ+ movement in relation to faith, family, gender and sexuality. 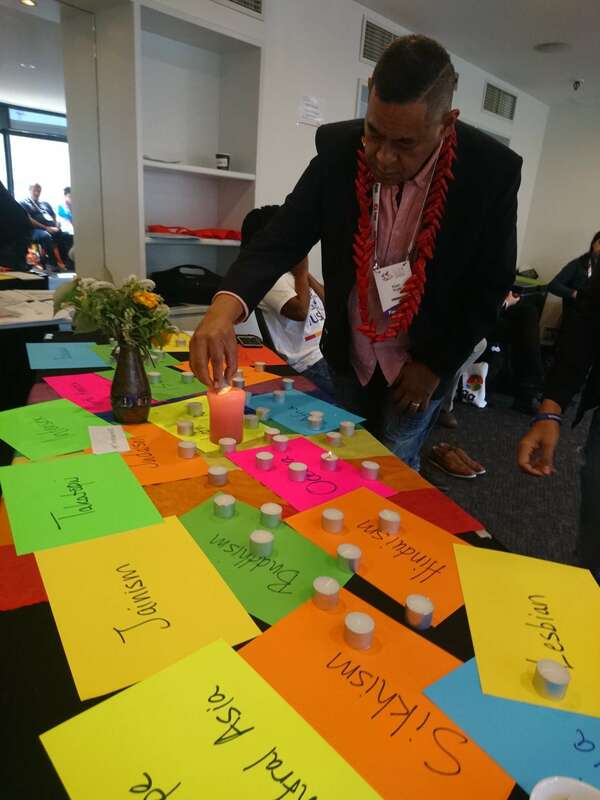 Tuisina Ymania Brown, one of GIN’s Board Co-chairs and Regional Board Member for the Pacific, delivered a powerful and moving opening speech that set an inspiring tone for the pre-conference. She reminisced on the struggles that so many LGBTIQ+ people have had to go through to get to where we are today, particularly lesbian, trans and gender non-conforming people. She challenged each of us to continue stepping up and challenging the constant silencing of woman, trans and LGBTIQ+ voices due to patriarchy, white supremacy and right-wing rhetoric. Ymania said that it is time to pass on the baton to our younger advocates, for them to take the lead and continue the good fight against all forms of hate, suppression and discrimination on any basis. 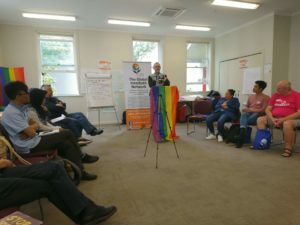 Creating a setting that allowed all attendees to freely participate was a key objective for GIN – to let LGBTIQ+ people of faith and spirituality have a space to be heard and tell their stories. We used some of the exercises that we do in our Hearts Set on Pilgrimage Retreat process in order to get conversations going. For some people it was a first-time experience and they were extremely moved by the space that was created and shared how valuable this was for them. Rev JP Mokgethi-Heath, giving a sneak peek into A World Once Whole, Day 1 at St Andrew’s on The Terrace. Another great moment was a sneak peek into the almost complete third book in the Human Dignity, Human Sexuality series. This book follows on the successful first two books, Behold I make all things new and I am Divine and So Are You. The third book takes a look into the varied religious and spiritual practices from 7 indigenous traditions around the world, including, for example, the Lumad people in The Philippines and the Khoi in Namibia. One of the writers and co-editors, the well known Rev. JP Mokgethi-Heath was able to be with us and read a few excerpts from the book aptly entitled A World Once Whole. Everyone is waiting patiently for the release of the book later this year. Jape spoke to the role of colonialism in the destruction of indigenous traditions, and the accompanying spread of Christianity and colonial era criminalization of sexual and gender minorities. We have returned from Wellington more driven to continue supporting the work that so many of our members do across the globe. We see the positive and affirming changes that are taking place in certain parts of the world and we are very aware of where spaces are becoming increasingly hostile and violent against minority groups – be they minorities based on faith, sexuality, or gender. This is why GIN exists – to build a world of acceptance of all people, so that gender and sexual minorities of faith may be free from harm, prejudice and violence and that they may participate as fully grounded individuals of faith in their contexts. Thank you to all our guests who attended our two-day preconference. So much appreciation to our partner organisations, allies and our members. We look forward to the next ILGA Conference in 2021/22.